In the early morning sunlight, the tour leads from the Jakobshorn down into the Sertig valley. The route is not excessively difficult, but requires full concentration. Ride uphill on the singletrail that is normally used as a downhill route. After being renovated, this stretch has become a good uphill route. After reaching the Rinerhorn train’s mountain station, you will have covered a thrilling singletrail. Follow the officially marked route to Monstein. The singletrail leads mostly down a gradual descent, but also has a few uphill stretches. 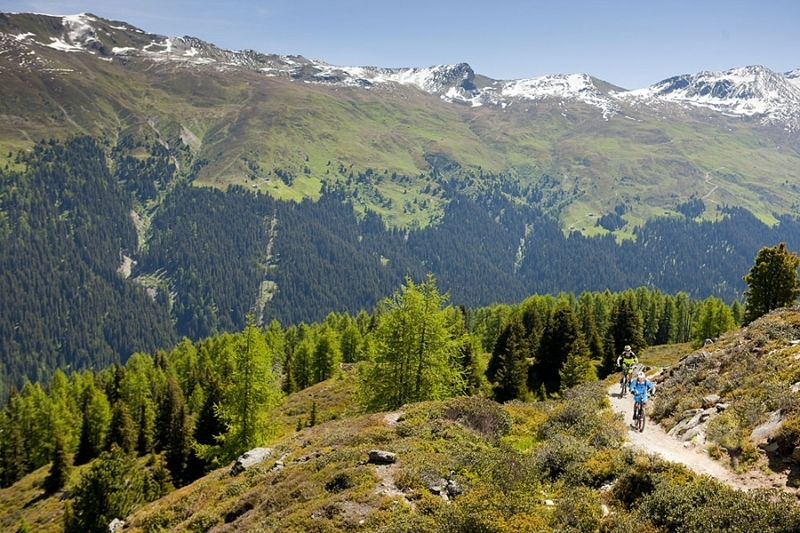 It is known as one of the most beautiful rides in the Davos area. After crossing the bridge, there is a challenging ascent on an alpine lane leading to the head of the trail to Jenisberg. This trail leads gradually downhill and offers great fun as it leads into the Zügen ravine. The old road then leads to the Bärentritt and then continues on trails past the Wiesen train station on to Leidboden before leading along the Landwasser river to the famous Landwasser viaduct. The final stretch winds along uphill to the Filisur train station, where you can take the Rhaetian railway back to Davos. Tip: You can ride the tour more pleasant by starting on the Rinerhorn.